• The very best resistors in key signal path applications. • ModWright Instruments capacitors in all critical areas. "This is a fantastic universal player which redefines the notion of a desert island machine as a DAC/player for all audio and video formats including the very latest in video technology. I like to think of the 105 as Oppo's third 'Ring' - The One to Rule Them All. I would love to have you review it. I am quite confident you would really like it." Given my happy ownership of ModWright's 6SN7-based LS-100 preamp and Mosfet-based KWA-100SE, that seemed likely. Op-position trumps Oppo-sition. Oppo decks have attracted the perhaps highest-ever mod support. This includes being harvested for rebranding by boutique makers. Rather than offense, team Oppo have taken the position of spotting opportunity. They've studied various outsider mods and over subsequent model iterations incorporated those changes which made sense within their high-value price structure. This attitude is a prime example for a new type of 'open-source' cooperation. As a result and despite being presumably universal video machines first, Oppo stock players do reflect keen awareness of audiophile concerns. It's why I've steered reader inquiries about CD players towards Oppo, either stock or tweaked up by one of the many aftermarket houses. To me it's more sensible than pursuing overpriced legacy CD-only machines. That's particularly apt when a deck like the 105 includes optical, coaxial and async USB inputs to operate as a standalone DAC plus does SACD/DVD-A natively. 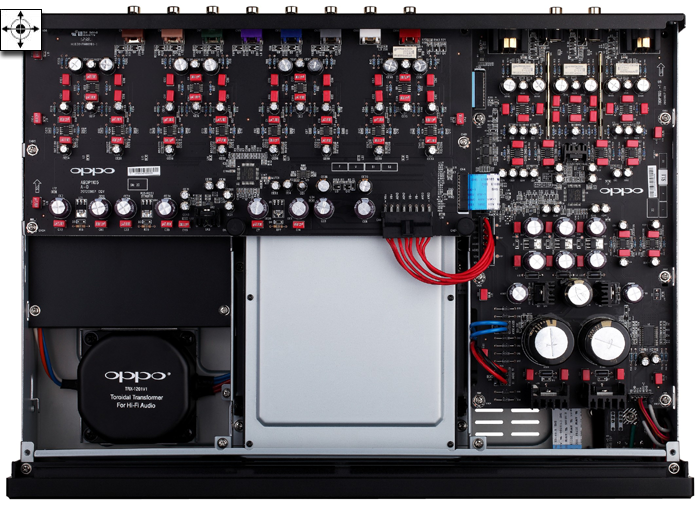 For a rundown of the BDP 105's specs and features, click here.